SEO company will be something you are looking for if you have decided to move into search engine optimisation. The internet is a business medium that is full of possibility and it is impossible to underestimate the impact it can have on your business. Unfortunately it is not just a case of building a website and waiting for the customers to arrive. The internet is infinitely large and filled with thousands of businesses all vying for trade. When faced with all this choice the consumer does the obvious thing; goes to Google and lets it do the hard work for them. When confronted with page upon page upon page of search results they will look at the top few of the first page, maybe the results on page 2, possibly the results on page 3. If you aren’t on one of those pages, the customer will not know that you exist. Having worked with many SEO companies and individuals in the past, I thought it would be worthwhile taking time to leave a review. I've been involved in the Digital industry for over 15 years and have encountered many people who claim to know what SEO is, and how it works. Quite simply, most don't, but Position1SEO most certainly do. They do things in a strategic and well thought out manner, and explain why. There's nothing done that doesn't have an impact or an explanation. The level of detail that's gone in to in order to deliver Page 1 rankings is at a level that I've not seen before. No question is too small, and they'll do anything they can to make sure you know exactly what is happening at any stage of the campaigns. I honestly can't recommend these guys enough. 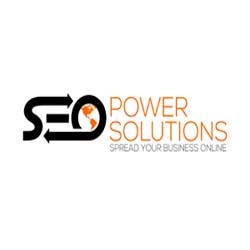 If you want good, white-hat, reliable SEO, then look no further! AVOID - Paid for a website audit and got nothing but screenshots of data I already had access to, a list of 'bad backlinks' which included major bodies in my industry purely because they had the word 'Sussex' in them a lot. One of the reports was not even for my domain name. Really good at contacting you pre-sale, but after that the response is poor. Position 1 SEO have been very professional from the outset. I purchased the 12 phase package and we’re currently on phase 8. I’ve seen great progress so far and rankings have improved. Looking forward to seeing more results and working further with Position 1 SEO. Having worked with other SEO companies in the past, Position 1 SEO have a much more structured approach and always meet phased timescales providing comprehensive evidence and reports of work done and results achieved at each stage. They are always quick to respond to calls/emails, very knowledgeable and do proper product research when undertaking a project. I was very impressed with technical knowledge on page content and articles they produced on a niche product. Highly recommended. We have been working with the Position1SEO team for a couple of months now. We are 100% satisfied with the service that we are receiving because in just a short span of time, we have seen positive changes in the rankings of our company website. Highly recommended! 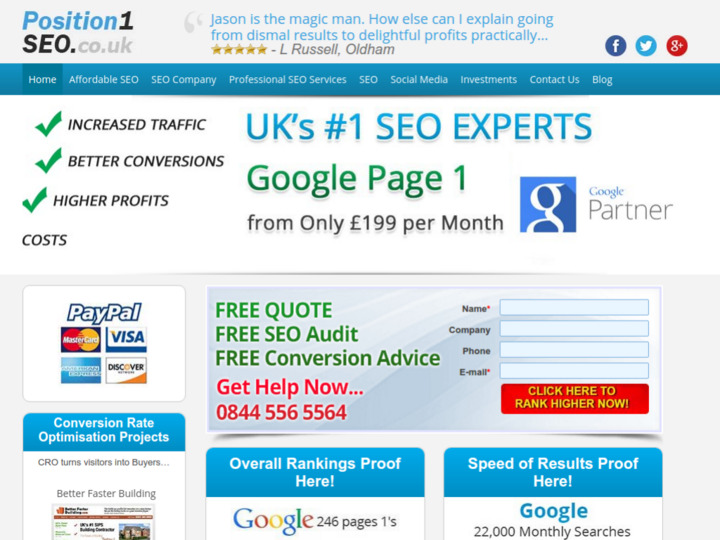 UKs #1 SEO Experts did a great job for us. They have been bringing us up little by little. We were down the drain. We are now begining to emerge. After they have completed the first phase of the project, we were very satisfied and are now continuing the project with them since we have hired them again for the monthly maintenance package. They are great, friendly, and, above all, very professional. Thanks to the Team! Position1SEO have guided me through the process with infinite patience and care! They are lovely people and very thorough. Position1 SEO is superior in results. Within a short few months, my pages are climbing up the charts. Great to work with, professional and attentive. I highly recommend this company.